This picture book is an excellent example of the cultural gaps between American children who have family in different countries. Mike wants his Grandma to accept her new life, while she longs for her old one. At the end of the story they learn to meet halfway and both get the best of both worlds. 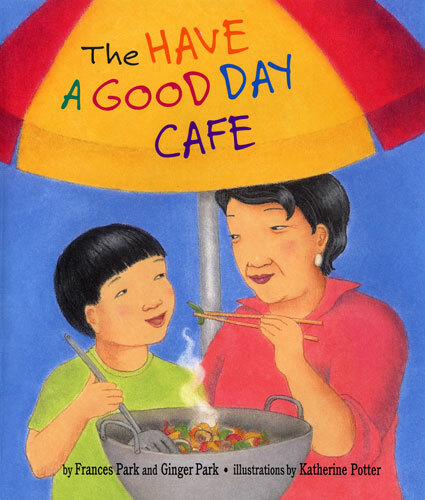 The Have a Good Day Café is highly recommended for families with cultural gaps due to generational shifts, or for children who want to learn a little more about Korean heritage. There aren’t a lot of Korean words, but all the Korean foods are referenced by their Korean names. Katherine Potter’s artwork consists of soft lines and shading, and portrays Mike’s city as a busy and diverse place. The text and the pictures speak well to one another throughout the book. Mike’s family is small, but the city he inhabits is complex and large, and both the text and illustrations work well together to portray this reality. By omilaju in Asian American Child, Asian Child, Boy Protagonist, child of an immigrant, First Generation American, grandmother grandfather on April 4, 2015 .